You are so loved little one with NoJo - The Dreamer Collection by NoJo - 8-Piece Piece Crib Bedding Set - Elephants Pink & Grey! This elephant inspired playful set includes an adorable, double-sided comforter featuring pink, grey and white mini dot elephant silhouettes on a baby pink background trimmed with grey border, the backside features a circle mini print in grey and white. The first crib sheet is a playful grey & white circle pattern, and the second crib sheet is a pink, grey and white elephant print.. The dust ruffle is solid grey with a border in pink and grey elephants marching across the bottom edge; the adorable decorative pillow comes in pink with grey & white dot elephants; a solid pink changing pad cover; a coordinating diaper stacker with circle printed top, pink elephant pattern below; with a super-soft coral fleece blanket in solid pink. Look for the whole line of NoJo -The Dreamer Collection matching accessories and nursery decor. NoJo - Only the Best for Baby! The 4pc Blush Pink Harper baby bedding collection by Sweet Jojo Designs will create a timeless look for your nursery. 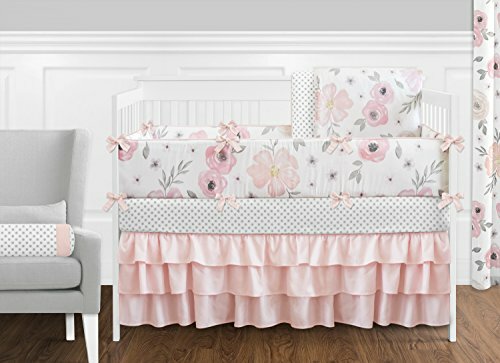 This delicate designer girl crib bedding set uses a sensational collection of exclusive brushed microfiber fabrics. 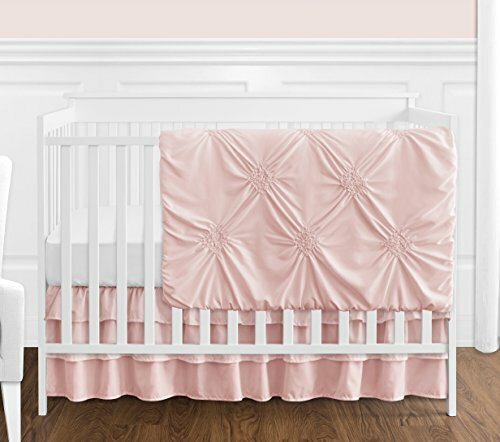 It features an elegant ruched diamond design in soft blush pink that will add texture and dimension to your nursery. This Sweet Jojo Designs set will fit all standard cribs and toddler beds and is machine washable for easy care and repeated use. 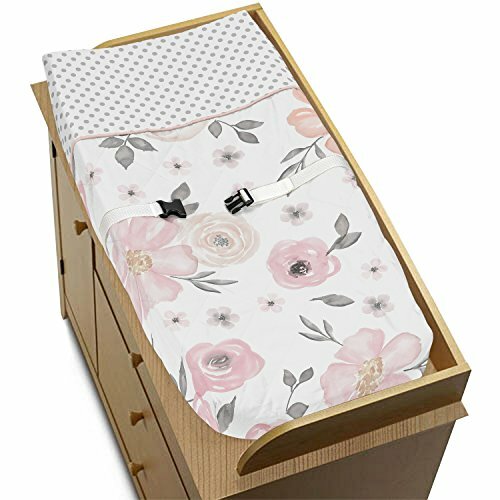 The 9pc Pink and Grey Watercolor Floral baby bedding collection by Sweet Jojo Designs will create an elegant and sophisticated look for your nursery. This artistic girl crib bedding set uses a sensational collection of exclusive brushed microfiber fabrics. It boasts a hand painted watercolor floral print, a mini grey polka dot, and solid blush pink fabrics. The gorgeous color palette of grey, white, and delicate shades of pinks will set your nursery up in high style. This Sweet Jojo Designs set will fit all standard cribs and toddler beds and is machine washable for easy care and repeated use. Sweet Jojo Designs creates various coordinating room accessories for all of their children's bedding sets including wall decor, hampers, lampshades and window treatments. The 9pc Amelia baby bedding collection will create a stunning boutique setting for your nursery. 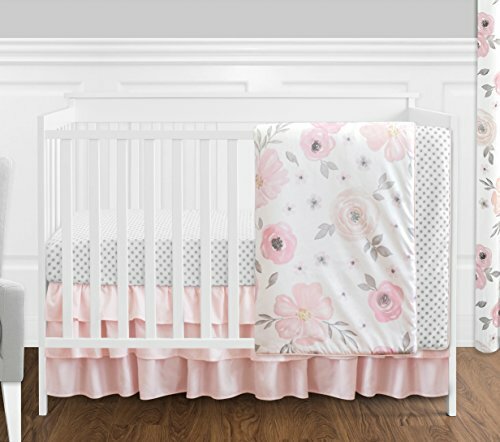 This elegant girl crib bedding set uses a sensational collection of exclusive 100% Cotton fabrics. It combines a delicate blush pink and white damask, a coordinating metallic gold polka dot, and solid blush pink and white cotton. 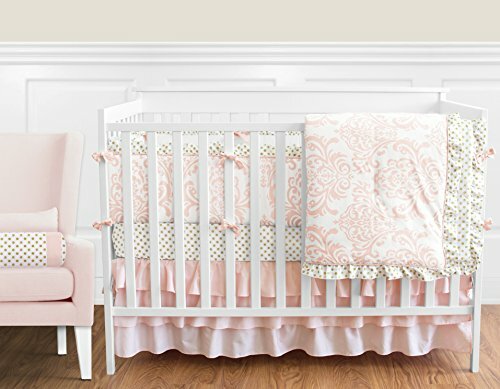 The beautiful color palette of blush pink, gold and white will set your nursery up in high style. This set will fit all standard cribs and toddler beds and is machine washable for easy care and repeated use. 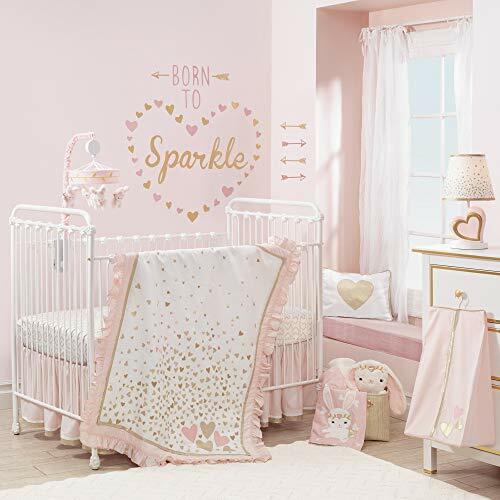 creates various coordinating room accessories for all of their children's bedding sets including wall decor, hampers, lampshades and window treatments. The 6-piece Heavenly Soft Minky Dot Crib bedding set fits all standard 28" x 52" crib and toddler beds. The set is made of an ultra-soft and elegant chenille material designed with plush minky dots. Set includes: heavenly soft crib skirt, heavenly soft reversible comforter, 100% cotton jersey knit fitted crib sheet, 2 heavenly soft side rail covers and 1 heavenly soft long rail cover. This set is so soft it is a must have for the baby's nursery. Machine wash with like colors, mild detergent and gentle cycle.